A delicious and easy weeknight salad that makes a great meal! The dressing is real star here with its sweet, salty and sour flavors…a real flavor sensation! Bring the steaks out of the fridge about 30-45 minutes before grilling Lightly coat both sides with canola oil and generously season both sides of the steak with Kosher salt and freshly ground pepper. Light grill to high. dress with approximately half of the dressing, tossing to combine. additional 4 minutes or until medium rare. Remove from grill and let rest for 10-15 minutes. Once the steaks have rested thinly slice the steaks across the grain and reserve on a plate. Combine all of the ingredients for the vinaigrette in a medium bowl and whisk to combine. Taste and adjust seasoning with the soy sauce or lime if needed. reserving 2 or 3 tablespoons, to the veggies and toss to combine. To plate, place about a cup of the cooked Asian noodles in a salad dish, top with about a cup of the veggie mixture and place 8 or so slices of the beef on the veggies. 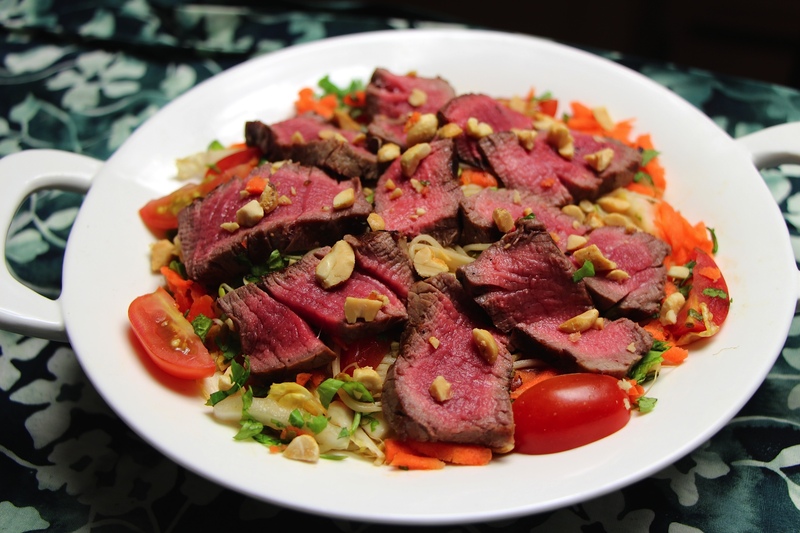 Drizzle a small amount of the dressing on the steak and sprinkle with a couple of tablespoons of the chopped peanuts.